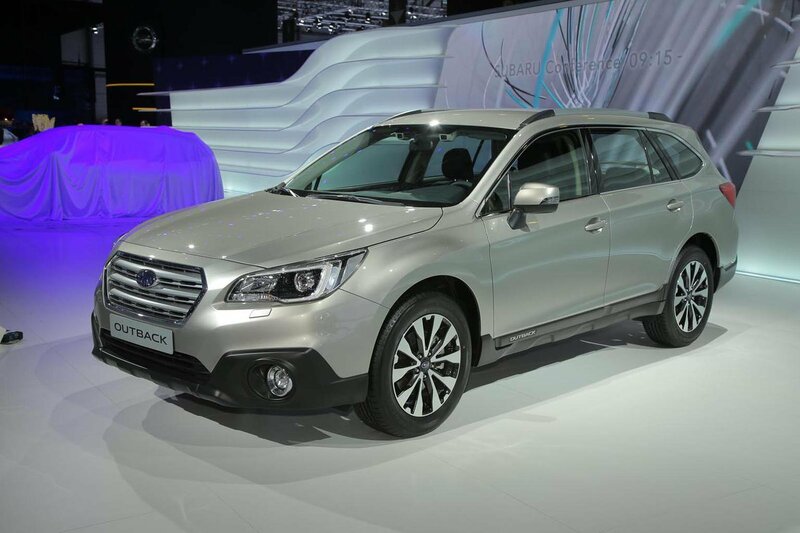 2015 Subaru Outback - pricing, specs and video | What Car? The full pricing and specs of the new Subaru Outback have been released, with the all-wheel-drive car going on sale from 1 April 2015. The fifth-generation of the Outback, with revised looks, a more spacious and higher quality interior and a range of new safety equipment. A choice of two engines is available; a 2.0-litre turbo-diesel that produces 148bhp and a 2.5-litre petrol unit with 163bhp. The diesel engine will come with either a six-speed manual transmission or Subaru’s Lineartronic CVT transmission, but the petrol engine will only have the CVT gearbox. Buyers have a choice of two trim levels; SE and SE Premium. SE comes with automatic LED headlights and headlight washers, cruise control, Active Torque Vectoring, 17-inch alloys, heated front seats, electrically adjustable driver’s seat and privacy glass, as well as a 7.0-inch touch-screen infotainment system that comes with sat-nav, Smartphone connectivity and a rear view parking camera. Petrol SE models also come with a engine stop-start system and Subaru Intelligent Drive, which allows drivers to choose between different engine modes. SE Premium adds a sunroof, keyless entry and push-button start, 18-inch alloys, leather seats and a powered rear tailgate. Standard on all Lineartronic Outbacks, Subaru's EyeSight safety technology is an autonomous emergency braking system that uses two cameras mounted in front of the rear view mirror to detect vehicles, pedestrians, cyclists and other potential hazards ahead. EyeSight includes pre-collision braking control and pre-collision throttle management, adaptive cruise control and lane departure and sway warning. The entry-level 2.0D SE Outback costs £27,995, while the range-topping 2.5i SE Premium Lineartronic comes in at £31,495. It remains in the same price bracket as the outgoing Subaru Outback. The Outback will face competition from other all-wheel-drive estates as well as SUVs. This means it will be up against cars like the Mazda CX-5 and the Skoda Octavia Scout. Our Target Price for the outgoing model of Outback is around 10% cheaper than list price across the range, so expect a similar discount for the new model.